L4G South West Herts District: Are you disillusioned by Brexit or being "Wedded" to the state? Are you disillusioned by Brexit or being "Wedded" to the state? Are you a tad more than a little bit mesmerised by events over the past few years? Do you feel that your relationship with the 'State' no longer serves you? It might surprise you to learn that you aren't alone. Amit Lahav started off by being quite angry about current events but then decided to channel that anger into a creative and positive idea for facilitating change. Amit Lahav is the owner of Gecko Theatre productions. He is also the creator of 'The Wedding' which is the result of his inspiration. "The Wedding" is played out from the perspective that we are all "wedded" to the state in some shape or form. It also helps us to consider whether that marriage is working for us, and challenges us to ponder whether a divorce might be a more satisfactory course of action! 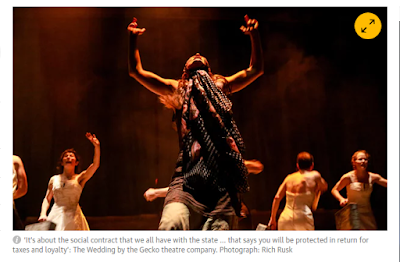 Lyn Gardner ( @ LynGardner) wrote for the Guardian back in April 2017 - Gecko - The theatre company divorcing post-brexit britain it is a great read if you would like to learn more about what to expect from the show. We are absolutely delighted to have the show coming to the Watford Palace Theatre on the 23rd through 25th January 2018... additional to the performance for those that are interested in "Taking Action" locally there is a Workshop on Saturday 27th Jan from 1-4pm (venue to be confirmed) where the intention is to bring "change makers" together, and take the energy forward into real local projects to effect change. Take a look at the Gecko Theatre website here... take a look at the Trailer, and book your tickets!